Duke Energy Renewables agreed to the sum after pleading guilty to charges over the deaths of 14 eagles in the past three years at the Wyoming sites. 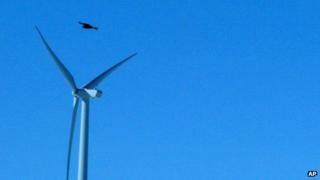 Duke Energy Renewables president Greg Wolf said the company "deeply regretted" the impact to golden eagles at two of its wind facilities, and had been working closely with the US Fish and Wildlife Service to "take proactive steps to correct the problem". Duke Energy Renewables is the renewable energy arm of Duke Energy. This corporation, with market capitalisation put at around $50bn, says it is the largest electric power holding company in the United States, serving more than seven million customers.